is a titanium-based screw or post that is implanted into the jaw bone in order to support an artificial replacement tooth, or crown. Together, the implant and crown will work to feel and function just like a natural tooth - making dental implants one of the best restorative options available in dentistry today. A patient can replace their missing tooth with a dental implant to avoid a number of problems associated with having a lost tooth. These problems include the shifting of neighbouring teeth to the area of the missing tooth, bite problems, decreased functionality and the disintegration of supporting bone – contributing to an aged and shortened overall facial structure. During a typical dental implant procedure, the implant is surgically placed into the jaw bone during one visit. 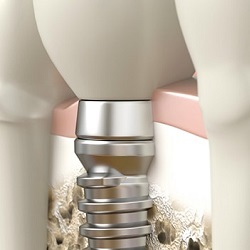 The patient will then go through a healing phase where the implant will gradually fuse with their natural bone (a process called "osseointegration"). This phase will usually take 3-4 months. After the implant has successfully merged with the jaw, the patient will be ready to have their crown or new tooth fixed to the post. Dental implants have an incredibly high success rate, and can often last a lifetime with proper oral care. Speak to us today about whether a restoration with dental implants is right for you! Our Guelph dentist would be happy to help you get back your optimal smile. Please call our Dental office in Guelph during regular hours on 519-824-8000, our staff will be happy to guide you through what to do in case of a dental emergency.